Scroll down to learn more about the different parts of the eye! Please note, these are short descriptions of various ocular tissues. They are not intended as comprehensive definitions. If you have additional questions, please contact us. This is a vascular layer that holds the blood vessels that provide significant nourishment to the retina and especially the macula. Malfunctions that cause macular degeneration often originate here. 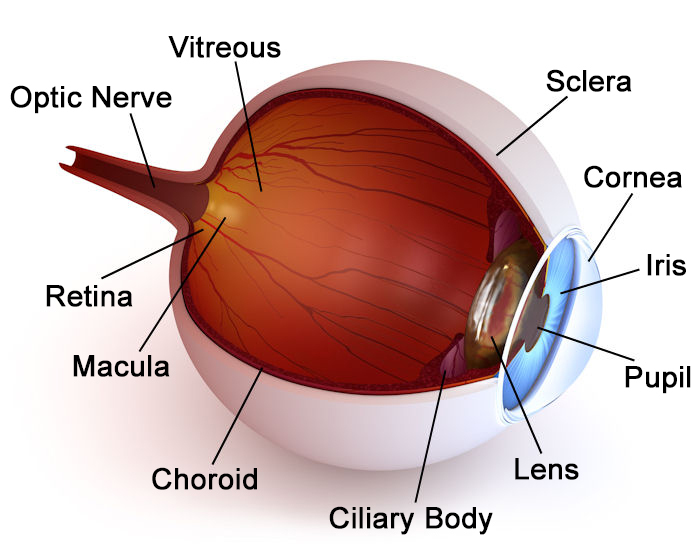 This has the muscle that causes the lens to change focus and also produces the fluid that circulates through the eye. This is the clear front “window” and the eye’s major light focusing surface. The cornea has more pain sensors than any other part of the body, making it extremely sensitive to trauma. This is the “colored part of the eye”. It acts to control the amount of light getting into the eye by changing the size of the pupil. The iris actually is not the front of the eye, it is behind the cornea. This controls how far away your eye is focused and is where cataracts come from. It is normally clear and quite soft. It can change shape becoming a stronger or weaker focusing lens thus allowing you to see closer or further away. This is the most sensitive part of the retina, all vision 20⁄100 or better is located in the macula. In order to achieve best vision, macular blood flow must be limited to behind the receptors. This makes the macula susceptible to health problems. This is the largest nerve in the body with over 1 million neurons. The end of the nerve in the back of the eye is visible to your eye doctor and is where damage occurs in glaucoma. This is the “black spot” in the colored part of the eye. The pupil is actually a hole in the iris. It allows light into the eye thus helping the eye adjust to an amazing range of lighting levels and conditions. This would compare to the film in a camera. It is at the back of the eye and receives light and turns it into signals to the brain. The retina is very fragile tissue which is very dependent upon proper blood flow to allow normal function. This is the “white of the eye”. The sclera is very tough and acts as the outer covering of the eye and protects the sensitive inner parts. This is a clear “jelly-like” substance that fills the interior of the eye behind the lens and in front of the retina. If you see floaters, they are located here.